If conservationists live up to the mantra of “managing change,” then we must accept that we are no longer conserving fabric, but rather conserving the meanings associated with fabric. The role of the heritage practitioner in the future changes from controlling meanings to facilitating the gathering and interpretation of meanings. If the conservation of meanings define practice in the future, then heritage practitioners need to collect and interpret these meanings with more depth and consistency than has been happening to date. A goal of practice should be to empower communities to recognize, treat, and interpret their built heritage and cultural landscapes. Heritage practitioners need pragmatic social science tools that are efficient and easy to use. Environmental design and behavior research, the conservation social sciences, and participatory action research may offer ready templates. It may not be possible to change much of orthodox conservation practice because existing laws and rules prevent any change in the types of values and meanings associated with heritage. Practitioners lack generalizable/transferable knowledge about people/place interactions with and sociocultural valuations of the historic environment in order to provide a proper context for interpretation and communication. Professionals in built heritage conservation often refer to their work as the “management of change,” which recognizes the impossibility of truly preserving or fixing, in time and place, the physical characteristics of a heritage object or landscape, especially when such objects must have a use. Conservation, therefore, becomes a process of making “good” decisions in the necessary interventions made to buildings, structures, places, and landscapes in order to sustain their existence. But, what then, are we trying to “conserve”? By definition, conservation aims to mitigate and limit change, and preservation, in its Ruskinian sense, even more so. If we recognize that change must happen to built environments and especially cultural landscapes, then what are we really trying to conserve? Zancheti and Loretto (2012) tackle this contradiction by arguing that while we’re managing change, we’re actually conserving the meanings associated with place. Taken to its logical extreme, the fabric of a heritage object can change so long as the sociocultural meanings associated with the object are conserved. A “good” decision then becomes one that conserves the sociocultural meanings of place. It is therefore incumbent upon the built heritage practitioner to recognize, gather, interpret, and understand a broad array of stakeholder meanings associated with place. The field of urban and regional planning, since it made the “communicative turn” many decades ago, consistently seeks community participation and input at many stages in the drafting of policy and planning documents. Orthodox conservation practice has benefited from this change as many comprehensive plans, for instance, now incorporate aspects of heritage conservation. It is quite common for communities to participate in workshops, public meetings, and focus groups in the drafting of planning documents, including those that address heritage. NGOs also incorporate stakeholder values in participatory processes, although many would argue that this is more the exception than the rule in most cases. So, yes, some of the values of community members are most certainly being used in the creation of heritage conservation planning and policy documents. But at what level do communities actually participate in these planning processes? Public meetings, which are the mainstay of government planning activities, barely allow any participation at all, usually limiting such “participation” to speaking for two or three minutes in an environment that reinforces the power that government staff and elected officials have over the public; the primary goal is to control the public’s behavior to the greatest extent reasonably possible rather than to maximize the collection of stakeholder meanings and values. Workshops (popularly referred to as “charrettes”) are far more “participatorier”, where community members are given much more time, power, and freedom to explore ideas. But even with workshops, the experts leading the process clearly control the resulting meanings and reports that are generated. Workshops are not intended to empower communities, but are far more relevant than public meetings in gathering meanings with any kind of breadth and depth. More effective methods for maximize power sharing between experts and community members that empower communities exist, but are currently not used to any significant extent in built heritage conservation practice. On the other hand, the depth of community participation in processes defined by law (e.g., rules and regulations) is practically non-existent by design. 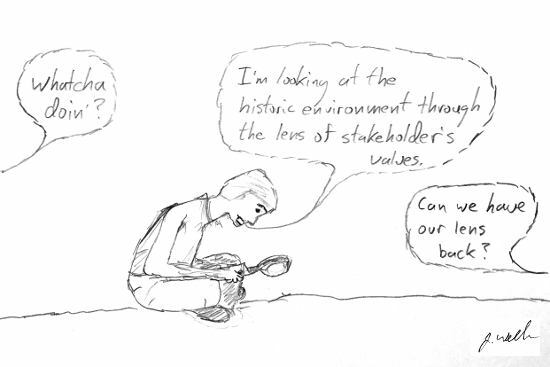 In this context, built heritage practitioners do not normally attempt to understand the values and meanings of most stakeholders when defining what is and is not heritage and how the authenticity of this heritage should be maintained. Instead, experts, who control the process, must use values that are defined by statute or rule. These rules are based on objective art/historical facts defined by orthodox theory and, as such, are potentially easier to defend in a legal context than the subjective values of most stakeholders. In these regulatory processes, it is important to note that experts do pay attention to stakeholder values if they are congruent with the value system stipulated by law. But, to expect heritage practitioners to take the extra time to collect and understand, in depth, sociocultural values in this system is unreasonable, given that such an endeavor would require extra time and resources and may not be legally defensible. Here’s an example of how this situation could play out in the real world. Sue is an historic preservation planner for Smithland, a local municipality in the United States that has a typical historic preservation ordinance, which is based on an enabling legislation from her state. This ordinance stipulates how historic buildings and districts are officially recognized and the ways in which Smithland can regulate the design of these buildings and places. The only values that can be used in Smithland to recognize heritage are historical facts associated with buildings and places and the values attributed by architectural historians to high style or vernacular architecture. Nowhere in this ordinance does it state that the values that the people of Smithland hold for their own built heritage can be used. Let’s assume that Sue was to go out of her way to collect heritage values directly from Smithland’s stakeholders and then use these values to recommend designation of a local historic district to her preservation commission. And, further, let’s assume that the preservation commission then approved the proposed district based on the heritage values of the people of Smithland. Sue would not only be likely to be reprimanded, if not fired, from her job for allowing this to happen, but this violation of due process would expose her city to substantial legal liability. Any citizen would then be able to sue the city of Smithland for failing to follow its own ordinance. At this point, some readers may say, “but what about Section 106”? In the United States, Section 106 of the National Historic Preservation Act mandates consultation with community members. (36 CFR part 800 defines this statute’s rule.) While the level of community engagement is higher than with other rules, the value system used to identify and protect heritage must still rest in the objective, art/historical values contained in the National Register of Historic Places criteria, not in the meanings stakeholders have for an historic place. The natural conclusion concerning the state of heritage regulation frameworks is that laws and rules must change to allow the use of a broader array of stakeholder values. There is a very limited body of literature to provide guidance on how this might be put in practice, however, and doing so is potentially difficult, at best (Lixinski, 2015). And, clearly, such a change would necessarily be highly political. A fundamental issue is the fact that administrative law, as used in the United States and many countries abroad, may not be adaptable to dynamic management systems that would be required to implement such change (Ruhl & Fischman, 2010). Many administrative procedure laws may therefore need to be changed to make such a system work effectively. In sum, while orthodox conservation practice does recognize and utilize a broad range of stakeholder values, the overall process is top-down and overemphasizes the objective, art/historical values of experts. If we assume that the goal of practice is to conserve the meanings associated with place, then the heritage practitioner needs to utilize a bottom-up process that emphasizes depth and community empowerment. Otherwise, too many meanings are never collected and understood, thereby compromising the overall conservation process. How can practitioners collect and understand a broader array and depth of stakeholder meanings/values? Putting the limitations associated with regulatory frameworks aside, many practitioners have a genuine interest in collecting and utilizing a broad array of stakeholder values in conservation activities. What tools are at their disposal? Certainly, community engagement tools used in general urban planning practice, such as workshops, are available and widely used. There are also a wide variety of tools used by social scientists that are particularly useful in gathering and understanding the meanings held by a group of people. These are the methods used by anthropologists, sociologists, psychologists, and humanistic geographers. These disciplines use research methods that are designed to understand people rather than things. Data that are most useful in the context of understanding meanings—the topic of this article—is qualitative in nature; many qualitative social science methodologies excel in collecting, interpreting, and understanding meanings. Quantitative data has its place as well, especially when the goal is to generalize or predict a certain phenomenon. The use of social science research methodologies to assess historical significance and inform the treatment of building and landscape fabric remains an unusual occurrence outside the occasional academic study, however. In the future, these methodologies could offer ways for heritage practitioners to understand how people are emotionally attached to historic places, how the historic environment facilitates the formation of community and personal identity, how places are perceived as historically authentic, and aspects of intangible heritage, among many other possibilities. In terms of guidance on the use of specific methodologies that could be employed in built heritage practice, the heritage studies field has coalesced around a set of commonly used possibilities. A particularly useful resource that describes some of these techniques is Heritage Studies: Methods and Approaches (Sørensen, & Carman, 2009). The field of environmental design and behavior research offers nearly 50 years of proven, field-tested methods for understanding people/environment interactions, and is especially rich with case studies. Within the discipline of environmental conservation, the field of conservation social sciences also offers useful social science research methodologies that could be used in an historic environment context. Lastly, I refer the reader to my whitepaper on significance and authenticity, which describes the use of mixed-methods for social science research. It is worth noting that the literature on participatory action research (PAR) is particularly useful in the context of facilitating heterodox practice. PAR emphasizes empowering community members to self-identify problems, create potential solutions, and then act on these ideas within an environment that respects local knowledge and traditions. While PAR is practically unknown in built heritage conservation, it is relatively common incommunity archaeology programs. PAR can also be found in the environmental conservation field, such as with participatory rural appraisals (PRAs). Although there are many potential social science tools, what built heritage conservation practitioners lack are pragmatic, applied methodologies that can be quickly and efficiently deployed. Critically, such methods need to be able to be used by people who may have little previous social science background. With the exception of rapid ethnographic assessment procedures (for instance, see Low ), very little has been published on this topic within built heritage conservation, which is an unfortunate situation, given the need for such methods. What makes a place “historic” to most stakeholders? How do everyday people perceive and value historic places? How does the historic environment affect people psychologically and physically? How do most stakeholders describe historic places and why they are important? What should/can we do with a wider range of values from stakeholders? Can/should community values be used in regulatory processes? How can conflicting values be addressed? Whose values are more important? For a summary of current empirical knowledge on the social sciences and the historic environment, I refer the reader to my article, “Making a Case for Historic Place Conservation Based on People’s Values,” in the National Trust for Historic Preservation’s Forum Journal, which is freely available to download. YouTube also has a video of my presentation on this topic at the National Trust for Historic Preservation’s 2014 National Preservation Conference. Lastly, generalizable knowledge is also important in terms of stakeholder communication. Too often, heritage professionals use their own discipline’s jargon, which obfuscates important messages intended for the general public. In order to more effectively communicate with most stakeholders, we need to know how most people describe the historic environment and authenticity, and why older buildings, places, and landscapes are important. To date, we have very little information to inform how heritage professionals can more effectively communicate with the public using the language of laypeople. A common critique of heterodox theory is that it appears overly critical of heritage experts at best and, in its most extreme forms, seems to advocate for the removal of experts altogether from systems that identify, protect, treat, and interpret heritage. The latter interpretation is not accurate, however; authors critical of experts in orthodox heritage practice seek not their removal, but rather their transformation into a role akin to a facilitator in many, but not all, cases. Heterodox theory does not negate the fact that some kinds of heritage demands that the objective values of experts must weigh more heavily in or dominate certain decision-making processes. Obvious examples would include objects of great rarity or informational value, such as the Egyptian Pyramids, the Roman Colosseum, or Angkor Wat. Between these kinds of heritage objects and the everyday environment is a gray area, however, in terms of whose values are more important — experts or most stakeholders. In addition, different values demand different roles for stakeholders, such as when interpretation versus treatment is being considered. At a minimum, heterodox theorists argue for an open discussion with as many stakeholders as possible to establish a value and power hierarchy. There will always be a need for experts in history, architectural history, and materials science. Experts are certainly needed to design and administer social science research protocols to answer questions that were discussed in the previous section. What changes in the heterodox system is that these experts share their power with most stakeholders as a way to dissolve expert rule. In other words, as Waterton, Smith, and Campbell (2006, p. 347) indicate, the value system of experts is then treated as “just another set of cultural values” among many other possible cultural values. Or as Lisanne Gibson (2009) asserts, experts are members of only one of many potential communities of practice; all communities of practice should be treated as equals, sharing power. Many of these ideas and goals are also found in PAR. The implication of the heritage expert’s transformation into an expert facilitator is enormous. Such a facilitator must seek the empowerment of communities, maximizing stakeholder participation to the greatest extent possible, while respecting local knowledge. Expert facilitators also should have a basic working knowledge of social science research. Currently, the curricula of most historic preservation degree programs in the United States does not include mandatory social science components, although students are certainly free to take such courses as electives. Similar situations exist internationally, with the exception of heritage studies/museum studies degree programs. My own institution, Roger Williams University, is unique in offering an historic preservation degree program that includes mandatory social science research education and also provides students an opportunity to put knowledge students gain into practice through theses, capstone projects, and community planning workshops. If we assume the premise that heritage conservation practitioners need to understand the values that people have for place, then what follows is that these professionals should be trained—to some degree—in the use of social science research methods. If we accept the premise that built heritage conservation should benefit people, then people should form the center of these efforts. Too often, however, conservation is framed in terms of benefits to objects, especially in contexts of authenticity. If authenticity is framed from the perspective of most stakeholders, then conservation practice needs to move from a sole focus on conserving the continuity of physical fabric to conserving the continuity of meanings. This shift from fabric to meaning does not negate the important role of experts in heritage conservation. It does, however, change the role and focus of conservation practitioners from controlling meanings to facilitating the gathering and interpretation of meanings. Even so, it is important to recognize that the orthodox role of the expert in conserving places with especially rare and unique qualities, especially where a great deal of informational value is present, should be retained. The difficulty remains, however, in who gets to make the decision as to the control of the meanings of certain heritage objects. Control of heritage meanings can also have particularly negative consequences, such as the recent destruction of antiquities in the Middle East by ISIS. Currently, with one exception, there does not appear to be any organization or group of people that is addressing how heterodox theory can be implemented in built heritage conservation practice. This situation is why I created the Historic Environment Network at the Environmental Design Research Association in 2008. The heritage and built environment professionals in this network have created a guiding document, “Principles for Integrating Environmental Design and Behavior Research into Built Heritage Conservation Practice,” that we hope is useful for both academics and practitioners. These principles establish a premise for the use of the social sciences in heritage conservation from the perspective of person/environment interactions. Fortmann, L. (ed). (2008). Participatory Research in Conservation and Rural Livelihoods: Doing Science Together. Oxford: Blackwell Publishing, 2008. Gibson, L. (2009). Cultural landscapes and identity. In L. Gibson & J. Pendlebury (Eds. ), Valuing historic environments (pp. 67-92). Surry and Burlington: Ashgate Publishing. Low, S. M. (2002). Anthropological-ethnographic methods for the assessment of cultural values in heritage conservation. In M. L. de Torre (Ed. ),Assessing the values of cultural heritage (pp. 31-49). Los Angeles: Getty Conservation Institute. Ruhl, J.B., & R.L. Fischman. (2010) Adaptive management in the courts. Minnesota Law Review 95, 424-484. Silliman, S. W. (Ed.). (2008). Collaborating at the trowel’s edge: teaching and learning in indigenous archaeology. Tucson: U of AZ Press. Sørensen, M. L. S. & Carman, J. (Eds.). (2009). Heritage studies: Methods and approaches. Routledge. Waterton, E., Smith, L., & Campbell, G. (2006). The utility of discourse analysis to heritage studies: the Burra Charter and social inclusion. International Journal of Heritage Studies, 12(4), 339-355.